Estonia plans to launch a CubeSat into space in early 2019 aiming to test advanced technologies, including a plasma brake for deorbiting satellites and electric sail propulsion. The mission, named ESTCube-2, will serve as a prototype of Estonia's future moon-orbiting spacecraft. 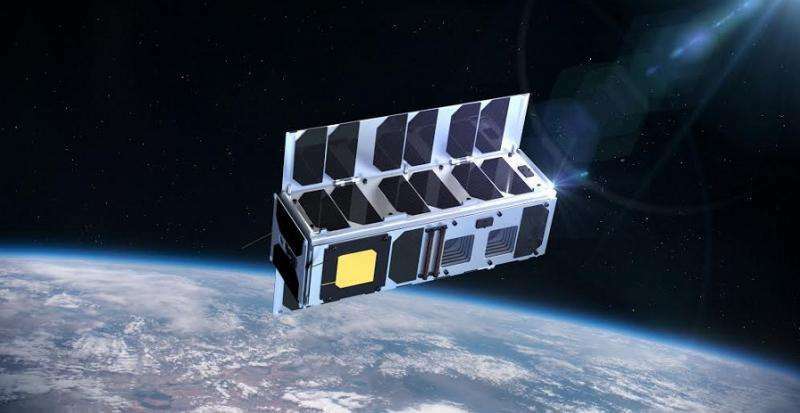 ESTCube-2 is a three-unit CubeSat developed mostly by the students of the University of Tartu in Estonia as well as other students worldwide in the ESTCube program. The satellite consists of the following subsystems: electrical power system (EPS), communication subsystem (COM), on-board computer (OBC), attitude and orbit control system (AOCS) and structure (STR). All the subsystems fit within 0.6 CubeSat units and will be integrated with the satellite's bus built by the Estonian Student Satellite Foundation (ESTCube Foundation) in cooperation with Tartu Observatory and the University of Tartu. This integrated structure will have several important goals once it reaches Earth's orbit. The spacecraft's main objectives are to test plasma brake deorbiting capabilities and electric solar wind sail (E-sail) propulsion. Moreover, the satellite will also take images of Earth, test a high-speed communication subsystem and test a corrosion resistant coating in space. "The main goal of the mission is the test plasma brake deorbiting technology which is very similar to the electric solar wind sail," Andris Slavinskis, ESTCube-2 Satellite Project Manager told Astrowatch.net. 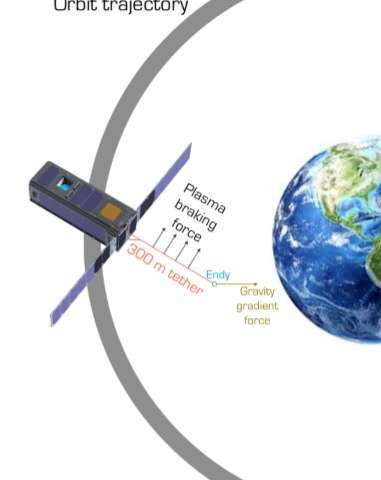 Plasma brake deorbiting is based on the electrostatic Coulomb drag effect that results in momentum exchange between a negatively charged body and ion flow by using a long thin electrically charged tether. That is why ESTCube-2 will deploy and charge a 984-foot (300-meter) tether, which will be used to reduce the orbit altitude of the satellite. This long tether could deorbit a satellite from an altitude of 435 miles (700 kilometers) to 310 miles (500 kilometers) in a half-year. "We expect to deorbit ESTCube-2 much faster than it would happen with natural aerodrag. It takes more than 20 years to deorbit from a 650-kilometer orbit. We estimate that a plasma brake with a 300-meter tether would do the job in less than a year. When tested, the plasma brake would be a strong component in space debris mitigation," Slavinskis said. The tether should have a mass of about 1.06 oz. (30 grams) according to estimates. Therefore, the plasma brake is a lightweight, efficient, cost-effective, and scalable deorbiting system with the potential to address the space debris issue at critical altitudes of 560 miles (900 kilometers) and less. E-sail is a propulsion technology based on extracting momentum from solar wind plasma flow and uses a positively charged tether, while the plasma brake is charged negatively. A previous test of this technology was attempted by ESTCube-2's predecessor, the ESTCube-1, which was launched into space in May 2013. However, the attempt was unsuccessful, as the sail cable unwinding mechanics did not survive the rocket takeoff vibration. Hence, the Estonian scientists place great hopes on the ESTCube-2, expecting that it could successfully test this novel technology, essential for future cheap, fast space exploration. Moreover, they see this CubeSat as a prototype of a more complex and difficult mission to the moon. "The main goal of ESTCube-2 is to test technologies for ESTCube-3 to avoid problems in much less forgiving and more expensive moon orbit. The reason why we want to launch ESTCube-3 to the moon orbit is that E-sail's authentic environment is the solar wind, which in low Earth orbit is blocked by the Earth's magnetosphere. From satellite design point of view, the lack of a magnetic field changes the way we can control the satellite's attitude. Instead of electromagnetic coils and magnetometers we are have to use reaction wheel, propulsion and star tracker," Slavinskis revealed. Besides testing E-sail and plasma brake propulsion, ESTCube-2 will take images of our planet. It will be equipped in the Earth observation imager (EOI), a small, lightweight, two-spectral imaging system. Near-infrared (650-680 nm) and infrared (855-875 nm) spectral bands of this instrument could be very helpful for vegetation monitoring purposes. ESTCube-2 will be also used to conduct a corrosion protection experiment in order to test material corrosion resistance in space. Moreover, the satellite will test a high-speed communication system which uses a field-programmable gate array (FPGA), allowing "firmware-defined radio." Currently, the ESTCube-2 team is now testing prototypes and working toward engineering model which is scheduled to be ready in summer 2017. Then, they would like to have the flight model ready in summer of 2018, which will give the team about a half-year to test it and hand it over at the end of 2018. "We hope to launch the satellite early 2019. We are negotiating the launch now. If everything goes well with ESTCube-2, then ESTCube-3 could be launched early next decade, but we don't know yet how difficult it is to get a launch to moon orbit," Slavinskis said.